I was sworn in as your State Representative in the 89th District on October 3rd, 2013. My first public comments were to thank my family, my friends, and Representative Jim Sacia who supported me. Then I spoke about our states pension crisis, saying, The states pension debt is growing by the millions each day. Those dollars could be used to fund education, senior services, and other important areas in the State budget. We must tackle this problem and protect retirees before the system is in total disarray. The legislature passed Senate Bill 1 to reform pensions that December, and as you recall I voted. No. I was convinced then, as I am today, that pension reform in Illinois must start with an amendment to the Illinois Constitution. It turns out that the Illinois State Supreme Court agreed with me when it declared SB1 unconstitutional in 2015. The reason is because Article VIII Section 5 of the Illinois Constitution says, Membership in any pension or retirement system of the State, any unit of local government or school district, or any agency or instrumentality thereof, shall be an enforceable contractual relationship, the benefits of which shall not be diminished or impaired. The pension crisis has only grown worse, to the tune of $130 billion. We already know the Chicago machines plan. Theyve done the math on what it will take to pay our current bill backlog and pension debts. It means another income tax increase, starting with people earning $7500 a year. You are already paying more taxes to state and local governments than families in any other state in the country. Our income taxes were hiked just last year. And our property taxes are punitive. Many of us know people who have moved, or are thinking about moving, because their property taxes are too high. It was Roy Disney who said, Its not hard to make decisions once we know what our values are. My values are simple. We simply cannot raise taxes on working families and retirees before making commitments to reform state spending and solve our pension crisis. Let me explain. Right now, pension costs amount to 25 percent of the state budget, more than any other state and almost double the national average! In 1995, the pension deficit was $20 billion. As I mention above, todays unfunded pension liability is $130 billion and growing. Take education related pension costs as an example. The Illinois Policy Institute tells us that by 2025, the state will spend more of its education budget on teacher pensions than it will in the classroom. I understand these numbers are astonishing. Identifying there is a pension crisis in no way diminishes the respect all of us have for our state and local government employees. No one is saying they do not deserve a pension. We are saying that the system as it stands today cannot stand much longer. Three factors have contributed to the crisis. The state has been shorting pension payments for decades. Crains Chicago Business reported that underpayments between 1985 and 2012 totaled $41.2 billion. Both Republican and Democrat governors contributed to the problem, the common denominator the Chicago machine. The second factor is the built in increases. Starting in 1989, cost of living increases were set at 3% and enhanced even more in the late 1990s. 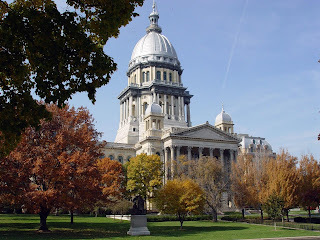 According to the Illinois State Supreme Court, once these were passed into law, they became protected by the state constitution and cannot be revoked without a constitutional amendment. The last factor is the contribution burden. According to the Illinois Policy Institute, Illinois workers contribute less to their retirements than the national average, putting more of the burden on non-government employees. There is hope. Other states and municipalities have managed to solve their pension crises. We can too. The Federal Reserve Bank of Chicago reported in its Chicago Fed Letter, No. 398 about a pension conference it sponsored with the Civic Federation earlier this year. Former Atlanta Mayor Kasim Reed spoke about how his administration addressed Atlantas underfunded pensions. Instead of kicking the can down the road, Reed chose to address the problem head on because the pension costs were threatening to crowd out public services. The President of the Professional Fire Fighters of Arizona, Bryan Jeffries, shared how his organization worked with Arizona state legislators to solve their pension crisis. His group focused on educating firefighters across the state about pension issues and eventually helped develop and pass both pension reform legislation and an amendment to the Arizona Constitution that permitted the benefit reforms to be implemented. Solutions are possible. They will require all sides to work together until we get it done. I look forward to the challenge.